A new fence is a big investment for a home. Fences last many years, and in many ways they define the look of the property. If you’re considering getting a new fence, price is one of the biggest factors you’ll have to consider – but how do you know if your contractor is giving you a good price? All of our quotes are free and no-obligation, so you can feel confident we’re just providing the best information for your fence work. 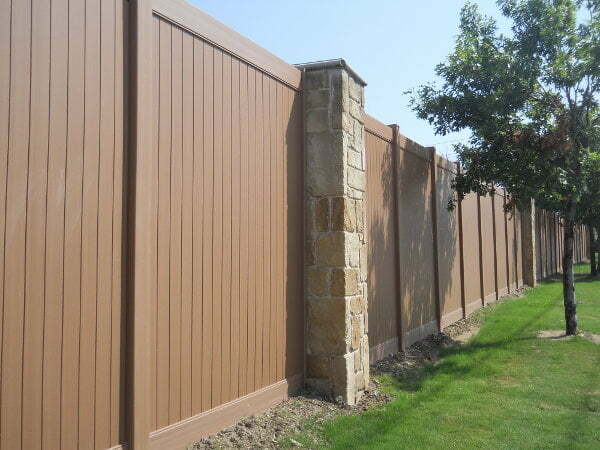 In most cases the biggest expense for your fence aside from labor is material cost. Depending on the type of fence you want, the material costs will be very different. In most cases, wood fences are the least expensive type of fence. However, the material costs depend heavily on the type of wood you choose. Less expensive woods like pine can be an excellent bargain, but they also don’t last as long and need constant upkeep. More durable woods, such as western red cedar, are more expensive but can last longer if they are regularly stained and sealed. A quality vinyl fence is comparable in price to a high end cedar fence, but also lasts far longer and needs virtually no maintenance to keep it in good condition. Even though vinyl might have a higher cost up front, it’s actually one of the most economical products on the market. You might wonder what you are actually paying for when you pay labor costs for fence installation. When you pay for a fence contractor to install your fence, labor costs pay for the wages of the installers, but they also cover several other important aspects such as insurance coverage and training costs. In other words, labor costs help ensure you get a high quality fence installed by trained professionals. In contrast, when you build a fence yourself or purchase through a big-box provider like a hardware store, you don’t get nearly the same assurances of quality. Many national chains use general contractors without any specific fence training, meaning your fence won’t be built to the same high standards and won’t last as long. Ask Questions – If there is something you don’t understand in your quote, feel free to ask about it. We’re always happy to explain our cost breakdowns, and other contractors should be as well. Know the Terms – It’s helpful to understand basic fencing terms before you get a new fence. That way you know what to ask for and can understand what is on your invoice. Get Multiple Quotes – If you feel like the quote from one company is too high, look around and try to get more than one. Just make sure you’re asking for comparable products and standards from each contractor. Read Reviews and Complaints – Finally, check out social media pages, online review sites, and the Better Business Bureau to see how other customers feel about their experience with a fence company. Reputable companies may even provide past customers as references. If you want a good deal on a new fence in the Dallas-Fort Worth area, call Future Outdoors today at (972) 576-1600. We’re the most experienced vinyl fence installers in the region, and we have the widest variety of quality vinyl fences for any home. Call today or visit us on Facebook to learn more about us and see pictures from some recent jobs!